Detailing is essentially that: working on very small parts ;-) On this page you will find a plethora of small thing that need to be done, even on a small locomotive with so few appliances like this one. I describe them in detail in the first place for myself, just as a kind of diary to remember what I did for following occasions. Secondly I hope to give you as a reader the advantage of picking up ideas. One hole was not accurate enough, so with a round file I "relocated" the hole. SHM 26 has a snifter valve on right hand side. This valve is an automatic anti-vacuum valve used when a steam locomotive is coasting. The word Snift imitates the sound made by the valve. 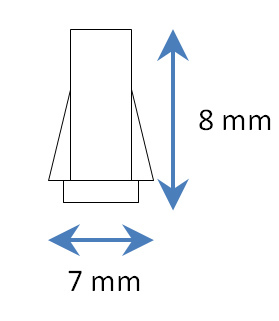 When the driver shuts off the steam to the cylinders while the steam locomotive is in motion, the moving pistons could create a partial vacuum in the cylinders. This would give rise to two problems. Firstly, the pumping action would absorb energy and prevent the engine from coasting freely. Secondly, when the exhaust valve opened, soot and cinders from the smokebox could be sucked down the exhaust pipe and into the valve chest or cylinder, causing damage. From my detail parts box I retrieved a part that provided a good basis. I snipped off the valve and filed the valve body straight. Fits! 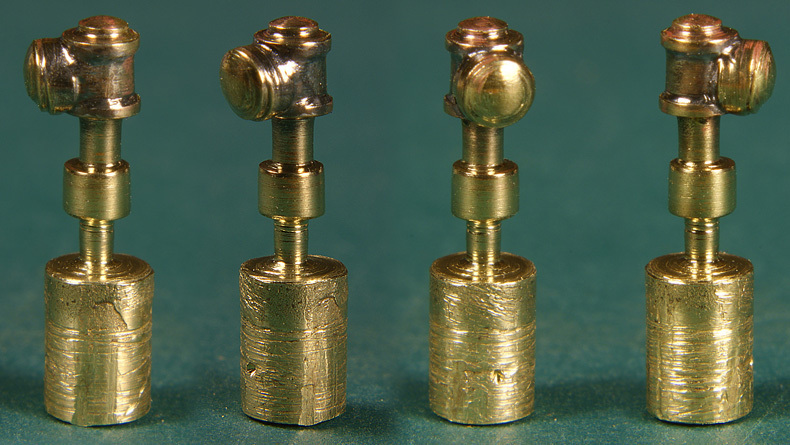 I soldered the two together and snipped off the oversize part of the brass rod and filed the cutting edge flat. The whole snifter valve is no more than 1.7 mm long. In place on the boiler. I did not fix it but stored it for now. As most of the valve will stay clear brass I will put in place only after painting. 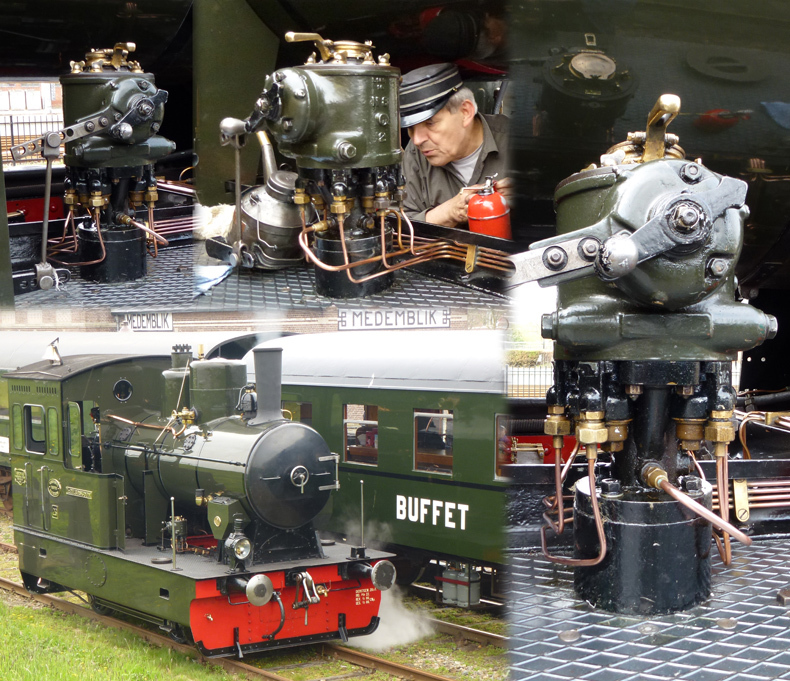 I had not noticed that the whistle was attached at the back of the steam dome. That was a hard place to get at with a drill once both domes are in place. But with patience and perseverance I could hand drill a hole. At the right an original wash plug. I set the speed to about 7000 rpm. I think I pretty much succeeded in making a third wash plug. Proudly looking at this photo I suddenly felt that the original wash plug was too thick by far. I decided to turn them all three down to say 0.3 mm. Considering that the wash plugs are almost flush with the boiler cover I think this is about the best result I can get. I glued them in place with epoxy. The bell on the cab's roof was not provided in the kit. Somehow I always have difficulty parting with the brass sprues that remain after all cast parts have been separated. I keep them in a scrap box labeled "you never know". 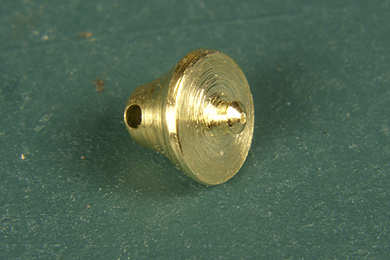 Now I needed to turn a smaller bell from solid brass and guess what? Out came the brass sprues to see which could potentially give a good go and one of them suited my needs! I turned the new bell in my Proxxon drill with files. The narrow cut is made with a metal saw in preparation to separate the bell from it base. The first attempt taught me how to work but the result was…to small! (middle bell). So I had another go and within minutes a had a bell that was almost spot on. I worked the base with a file all around to give it a more fitting size. 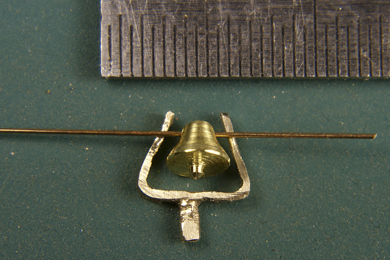 From 0.3 mm phosphor bronze wire I produced the hinge including the lever for the pull cord. I soldered the hinge to the base frame. The paper shim is to prevent solder slipping into the bell. It is a bit smallish. The man, "my uncle", is a 1:87 figurine. 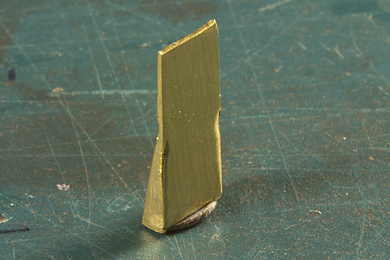 0.2 mm brass can easily be cut with scissors. Fast and precise. Flatten it by rolling with a steel bar. As you can see above, this space under the boiler is delimited by rather hefty L-profiles and I thought it would be nice to copy that, to hide the conspicuous nothingness under the boiler of the model. Now I soldered the pump to its support. To do that I clamped it in an ordinary laundry peg. The pump is difficult to hold and clamping in a normal vise will damage it. The coal hatch has an issue you wouldn't expect in a quality kit like this: it is too small. There is a distinct and obtrusive gap between the hatch and the boiler. In theory this could be correct if the coal bunker were to stand proud of the boiler. But my photos confirmed what I already suspected: the coal bunker hatch has a hinge some 15-20 cm away from the boiler and there is a strip on top of the coal bunker that completely fills the void between hatch and boiler cladding. So I made a strip of 0.3 mm brass sheet, soldered it under the hatch and filed it to fit. First the boiler needs to be soldered into place. The hatch has a little notch to accomodate the boiler ring passing along the hatch. If you solder the hatch first, the boiler will get stuck when you try to insert it. Undoubtedly there are tricks to manipulate the boiler once the hatch is in place, but make it yourself easy and solder the boiler first. Soldering took place from the outside. That requires some extra cleaning but it is simply impossible to solder it from the inside. I used 140 C solder so I would not disturb other nearby solder seams. I did not solder the seam between the hatch and the boiler. The solid brass boiler drains all heat and the solder simply will not flow. I made that seam as narrow as possible by working very accurately. The lubricator is another part that was not included in the kit. This is excusable as the lubricator was probably not present before the restoration of 2000. anyway it is a very modern appliance, easing the task of the engineer. From the phot I estimated the height and from there the various other sizes. I also had to decide which details to leave out. Modelling in 1:87 is not so much about how to model details but to acceptable choises about which details to leave and yet get the idea. I had great diificulty positoning the lubricator in its hole and keep it there. After some halfhearted attempts I called Blu-Tack to the rescue. A nice blot to grab, position and support the lubricator and hold in place until the job was done.